Every single company is a design company. Some are just better at it. Why is that? Businesses are by default trained to analyze past events to create reliable future results. But a bias towards consistent outcomes gets in the way of innovative disruption and market leadership. And what helps you” stay ahead” does not necessarily help you “stay clear” of competition. But “Design Thinking” blends the intuitive with the analytical, causing a paradigm shift in the way we explore and our ability to innovate. 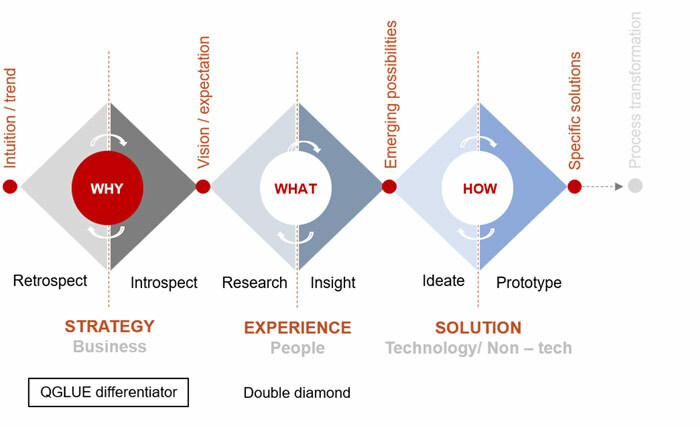 It is an elegant 3 step framework that seeks to democratize the principles of “human centered design” to a point where every individual, function and organization can benefit from it. QGLUE OFFERS DESIGN LED INNOVATION ACROSS 4 PRACTICE AREAS. Candidate expectation and behaviors have changed dramatically in an increasingly diverse, digitized and “on demand” economy casting Human Resources in a new role, from that of a “policy developer” to an “experience architect” & “brand custodian”. QGLUE helps you leverage Design Thinking for Talent that enables you to craft more a meaningful employee journey informed by a deep understanding of work and emerging workforce segments. Talent Audit: In-sighting and alignment of business (vision) and people strategies and values. Enablement: Training, certification and skill building to foster a culture of constant learning & innovation. Business Alignment: Transforming the value of HR strategies using our employee experience framework. Innovation Culture: Help organizations embrace an adaptive design mindset more conductive to collaboration & ownership. Re-imagine Work: Co-create human centric people processes including on-boarding, performance management, feedback and engagement. If you’re solving a problem, you’re designing a solution. Everyone designs, whether it’s conscious or not. And at its very heart, design thinking is simply a learning mindset that teaches us to solve better by asking better questions. At QGLUE we are focused on helping you solve for questions that often address unarticulated needs and desires that customers didn’t even know they had. Design Research: In-sighting and journey mapping to investigate ethnographic behaviors and uncover pain points and opportunities. Service Process Benchmarking: Evaluating peer performance across brand touch point using proprietary tools. Customer Segmentation: Co-creating detailed user personas and high value target customer pools for building future growth. Service Design: Crafting more memorable customer experiences using our unique framework that works across people, processes, assets and culture. Experience Enhancement: Continuously iterating, prototyping, testing and monitoring re-designed customer experiences in order to build a culture of sustainable innovation. Staying ahead of the curve often requires nontraditional, even disruptive approaches towards problem solving, principles at the core of Design Thinking. QGLUE helps you combine technology, human insight and commercial sense to serve unmet, unsaid market needs and expand what you believe is possible. Future Envisioning: Our research team is committed to studying and analyzing business landscapes and emerging customer trends and preferences that help build capabilities to leverage future opportunities. New Business Scoping: We assess existing competencies and enable discovery of user centric adjacencies and opportunities that help accelerate your growth trajectory. Design Informed Strategy: We collaborate with senior leadership to seed the design perspective in high-intensity visioning & strategy workshops. Accelerator Cell: We handhold and help you build an in-house center of excellence that can power a participatory approach and smart experimentation to design and validate ideas faster and better. Venture Design: We work with you to identify opportunities, conceptualize solutions and also build the complete ecosystem required to launch new businesses. Innovation demands a more holistic focus on the internal and external customer journeys that cut across functional silos and teams, supported end to end by design led operations. QGLUE collaborates with you to envision and design future ready processes that can seamlessly support your technological and organizational transformation. Current State Process Mapping: In place of quality focused mechanistic mapping, we undertake a human centered exploration of the experience underpinning those capabilities and the challenges therein. People First ITSM: We help audit and co-create IT services that better serve customers, motivate employees and most importantly, also elicit superior emotional response. Left 2 Right Project Management: We share methodologies, best practices and tools designed to reduce left brain biases in favor of more human centric exploration of project solutions. Business Process Modeling: We use methodological guidance to enable a shared understanding between key stakeholders that facilitates deeper empathy and continuous innovation. Future State Process Design: We advise and collaborate on a future ideal state blueprint to bridge the gap between your front stage performance and backstage operations.